not shifting burden to somewhere or someone else. We offer the following life cycle assessment (LCA) services to help you determine the full environmental and human health impact of your products as well as build capacity within your organization. Streamlined LCA Study - Streamlined LCAs allow you to quickly and cost effectively determine areas of prioritization within your organization. - What are the hotspots? - Which substances are most toxic in your product? 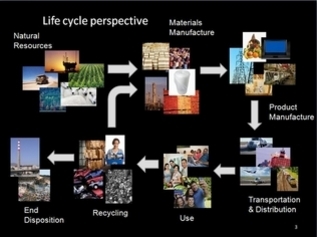 - Which phase of the life cycle is more impactive? This offering is a low risk way to enable you to understand what LCA is, and how it can help your organization prioritize resources to adopt more sustainable business practices. This work can typically be completed within 2 - 4 weeks. Internal LCA Study - An Internal LCA study is a deeper dive into the aspects of your product, product lines or comparison to competitve products that will not be disclosed externally. The purpose is for strategic planning and capital investments where greater detail and rigor is necessory. This work typically involves full life cycle consideration - from cradle to grave. Depending on data availability, a typical internal study can take 8 - 16 weeks to complete. External LCA Study - An External LCA study is typically used to support single issue claims of environmental performance (Type II Claims - ISO 14021) or broader more comprehensive environmental product declarations (Type III Claims - ISO 14025). This work typically involves full life cycle consideration - from cradle to grave and assurance that all relevent impacts are covered. Depending on data availability, a comprehensive study can take 3 - 6 months to complete. External LCA studies that may involve contentious results should include third-party review. External LCA Study to Support Policy Position - An External LCA study that is used to support a policy position requires extensive research and review. Government agencies, Non-governmental Organizations (NGOs), industry consortia, and commercial entities use LCA as a means to support or refute the merits of current and proposed enironmental policies. Depending on data availability, and level of rigor required, an external comprehensive study can take 6 - 12 months to complete. External LCA studies used for this purpose require third party review. LCA Capacity Building - We offer training services to help you get up to speed on what LCA is, how it can be used, and as important its limitations. We cover state-of-the-art practices, software tools, trusted databases, impact assessment science, methods of interpretations, formulating environmental claims, and best practices to conduct and manage LCA studies. Methodological Development - At Industrial Ecology Consultants we have experience developing impact assessment methodologies, from ecological toxicity characterization, normalization datasets, to weighting schemes. We can to assist your organization in the development of leading edge life cycle impact assessment methods. Third Party Critical Review - Comparative studies released to the public require third party critical review. At Industrial Ecology Consultants we have performed and chaired several third party reviews for select clients. We can assist your organization in the careful review of business critical assessments. EC Product Environmental Footprint (PEF) methodology.